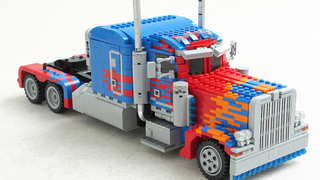 Must have been a hell of a challenge to build this custom Optimus Prime with LEGO bricks on a scale like this. It’s the movie version of the leader of the Autobots, but that’s excusable, since it’s not just a huge truck, but a fully transformable model. Here’s Optimus Prime below in its full glory. Head over to Mad Physicist’s Flickr stream (via BrickNerd) for more shots.